Cape Arundel is pleased to provide the best in professional golf instruction and custom club fitting. Our lessons and clinics are conducted at our Practice & Teaching Facility. Designed and fitted-out to be the premier golf practice facility in New England, it includes over an acre of laser leveled natural turf teeing surfaces, three greens built to USGA specifications, two short-game areas with bunkers and twelve state-of-the-art synthetic tee surfaces for early season and rainy-day use. The driving range features multiple target greens located throughout the range which extends to over 400 yards. 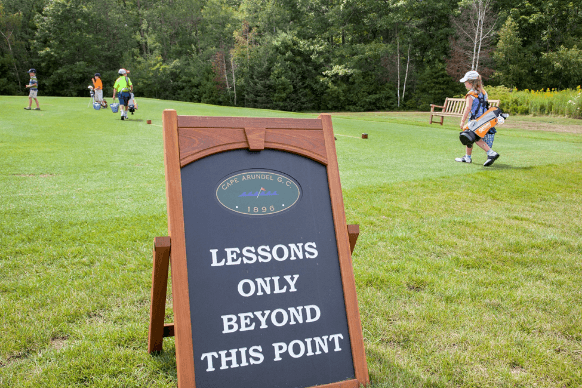 Our Golf Professionals are also available for playing lessons on the course. Properly fitted clubs greatly enhance your game potential. We recommend review after a few lessons and before a purchase. Dale Abraham, our Director of Instruction, is a GOLF Magazine Top 100 Teacher, Golf Tips Magazine Top 25 Instructor, Golf Digest Top Teacher in State of California, 2013 Southwest Section PGA Teacher of the Year, and 2008 Southern California PGA Teacher of the Year. As a CHEK Certified Golf Biomechanic, a Level 3 TPI Golf Fitness Instructor, a TPI Level 2 Power Coach, an AimPoint Express Certified Instructor, a TrackMan Certified Instructor, and a PGA Certified Professional, Dale has successfully worked with both male and female students off all levels, both amateur and professional. His students have included PGA Tour, Champions Tour, LPGA Tour and Web.com Tour players; collegiate All-Americans; elite junior golfers including the SCPGA Junior Player of the Year and two Girls’ Junior World Champions; and Senior Amateur Champions.